We Specialize in Personal Service & Attention to your Needs. Quality Service and Your Satisfaction are our primary goals. 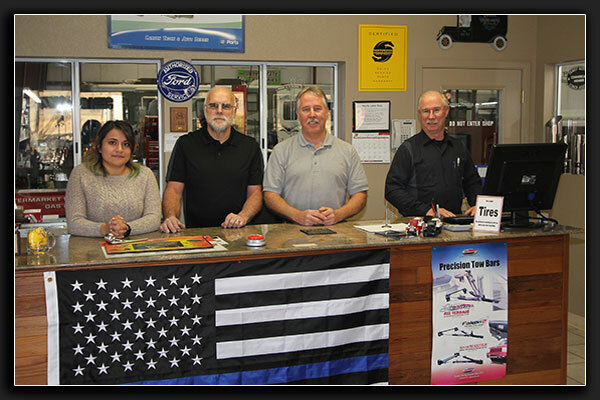 Our service advisors are professionals with training and experience in most late model Cars, Trucks, Motor Homes, Motor Home Components and service techniques. 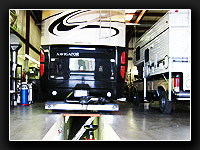 Our entire facility has been designed and built to accommodate Motor Homes and other large vehicles. How can we help you? CLICK HERE for Official Information about the United States Flag. CLICK HERE for Official Information about the Thin Blue Line Flag. 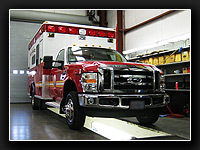 Your vehicle will stay clean because Our Shop is Always Clean. We take great pride in our work and our shop. You and your vehicle are always treated with respect. We will always do our best for you. 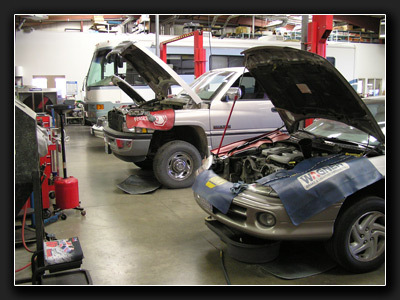 This picture shows one portion in our always clean service area. CLICK HERE for interesting information about Motor Oil. 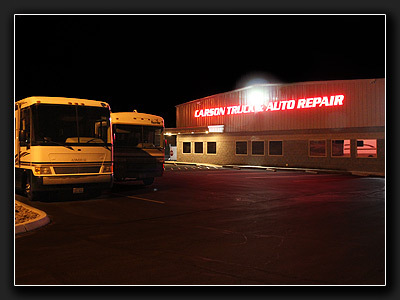 Quality service and Your Satisfaction are our primary goals. We Specialize in Personal Service & Attention to your Needs. 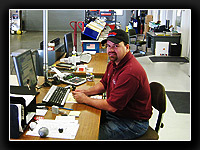 Our service advisors are professionals with training and experience in most late model vehicles and service techniques. 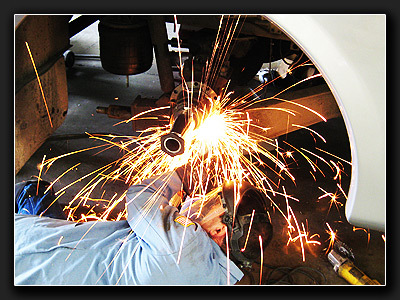 Let us put our expertise to work for you. 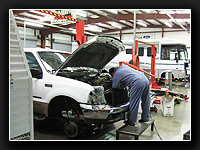 Another view of our always clean service area. 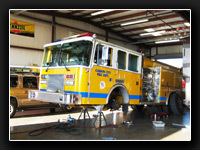 CLICK HERE for local Carson City information. Welding repairs and fabrication available. Our shop offers welding, fabricating, grinding and polishing, suspension and brake repairs, frame modifications and repairs and more. This motor home is getting a new axle spindle welded on to the differential housing. 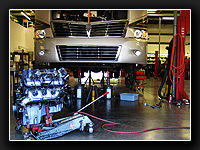 Full Service & Repair on most Late Model Cars, Trucks, RVs, Motor Homes and Trailers including Commercial Trucks up to Medium Duty. 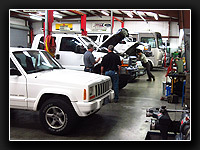 Most Fleet Accounts, Extended Warranties and Government Agencies are welcome. We're watching out for you and your rig. 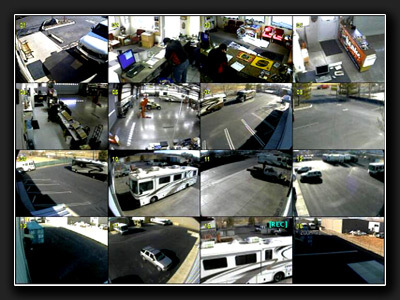 Our entire facility is completely fenced and monitored 24/7 with a state of the art video recording system that can be viewed from anywhere. You're Safe With Us. We have 2 acres of fully fenced parking. 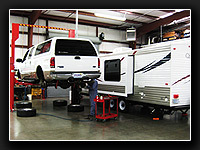 We have room for any size Motor Home or Trailer and can accommodate travelers with emergency breakdowns. Towing and Low Boy service is available. We work with Insurance Companies, Extended Warranty Companies, Manufacturers, Dealerships, Government Agencies, Fleet Accounts and Roadservice Providers. 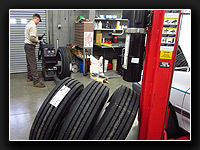 When you need Routine Service, Major Repairs, Tires or Emergency Repairs we are the shop you are looking for. Thanks for checking out our website.